I don't call my dear old great-grandfather The Elusive George for nothing - not only did he change his identity and keep the reason secret, he also managed to hide his whereabouts on four different censuses! Okay, he probably didn't do that on purpose, but who knows. I'll give him the benefit of the doubt on the first one - it was taken at the end of March 1851, and he wasn't born until two months later, and I'm pretty sure it wasn't his fault. And the really interesting thing is that I can't find his 24 year old sister Mary Ann or his 14 year old brother Alfred, or their 22 year old cousin William Hopper, who lived nearby in Fremington, in that census either. All of these people show up again later in several documents, so I know they were somewhere in 1871 - but where? And were they all together? It seems like too much of a coincidence for all of them to disappear at once if they were in four different places. William and Mary Ann were in love, but being first cousins, they kept their relationship secret, and ran away together. George figured it out and went after them, and Alfred came along for fun. On the way back home, all four of them slept in somebody's barn and nobody knew they were there. George, Mary Ann and William were celebrating someone's birthday, and got so drunk they fell asleep in somebody's barn and nobody knew they were there. Alfred was behind the bike shed, smoking. George, Mary Ann and William had all decided to leave north Devon but couldn't afford the train fare to go anywhere, so they walked, and spent the night in somebody's barn and nobody knew they were there. Alfred had told his parents he was spending the night at a friend's house, but actually it was a girlfriend, whose parents didn't know he was there. Or, to stop being so silly, perhaps all four of them went to Barnstaple to see their Uncle George, and stayed overnight. Of course the census taker may not have got around to knocking on Uncle George's door for a month or more after census night, and he could easily have forgotten what night it was that four extra people were in his house. Obviously, if something along those lines happened, I'm never going to find them. This is part of a page from the 1911 Canada census, which is the next one where George wasn't where he should have been. 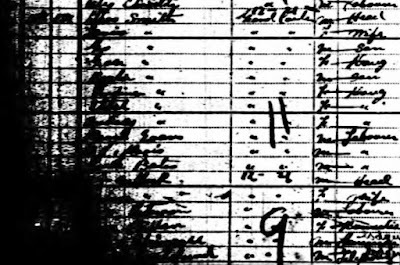 You can probably make out the name Smith near the top - that's George, now known as Thomas, abbreviated to Thos on this census. The seven names below that are Louisa and six of the children, but if I hadn't known their names I would never have found them, because the transcriber couldn't read them and just guessed, badly. Fortunately their birthdates (not shown in this excerpt), are vaguely legible, so I used those to figure out who was who. The names at the bottom of the page weren't transcribed at all, not surprisingly. 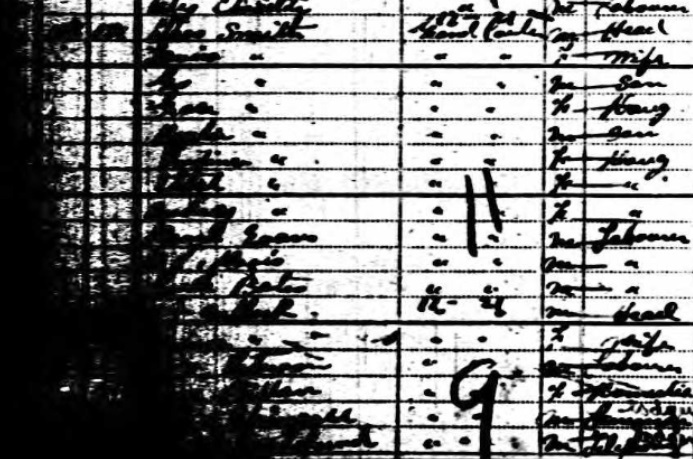 Ironically, finding George in this census came as a disappointment - he wasn't supposed to be in Canada in early June when the 1911 census was taken, he was supposed to have gone back to England for awhile. I thought he had left Canada in late May that year, but if so, there's no way he was back on the first of June. Once again, it could have been a memory thing - the census taker might have arrived several weeks after the first of June, and whoever answered the questions forgot that George wasn't home on census night. Or, I've got his travel dates completely wrong and I need to go back to square one. Ten years later, George disappeared again, and this time, so did Louisa and their youngest daughter Audrey. I think they must have been travelling in the United States on census night. But here's the twist - they lived in Regina, Saskatchewan at that time, and I know the addresses of both houses they had there, but I don't know exactly when they moved from one to the other. So I searched the 1921 census for both of those addresses, expecting one or the other to not show up, as nobody was home. But they're both there, each with a family in residence who I never heard of! What the ...?! It'll be a few years yet before I get to see the 1931 census, and I won't be at all surprised if George is missing from that one too. He's very good at driving me crazy.